In 1980, Paramount Pictures unleashed Friday the 13th and Jason Voorhees upon the world. Spawning nine sequels between 1981 and 2002, Jason became one of the most memorable horror villains of all time. However, Jason wouldn't have all the slasher spotlight to himself. New Line Cinema and horror maestro Wes Craven introduced a villain in 1984 that would himself become a cultural icon: Freddy Krueger. Freddy's first apperance, A Nightmare on Elm Street, has become one of the most heralded movies in the genre and spawned six sequels between 1985 and 1994. Slasher movie fans have been wondering since the late 80s what would happen if Freddy and Jason fought, and when New Line Cinema acquired the Friday the 13th franchise in the early '90s, it looked like it might actually happen. Both guys are owned by New Line, they'd have to make it. Right? New Line even hinted at a possible Freddy/Jason showdown in the final seconds of Jason Goes to Hell in 1993. Unfortunately, the movie languished in develpmental hell for a decade. Dozens of writers and scripts came and went, but nothing happened. In that time, Jason went to space and Freddy went to Hollywood, but years passed and the idea seemed forgotten. But on August 15, 2003, the decade of waiting ended and the world bore witness to the ultimate clash of the titans. Jason and Freddy finally do battle, a movie that slasher fans have been waiting what seems like a lifetime for. The movie actually tries to have a deeper plot than other Fridays and Nightmares, so let's get to that. We start with a monologue from Freddy (Robert Englund). Everyone in his hometown of Springwood has managed to forget about Freddy, and the fear he thrives on is gone. That makes sense to me. Freddy hadn't been seen since 1994's New Nightmare (which, like Jason X, has no bearing on Freddy vs. Jason's continuity), so I'm sure many people really had forgotten about him. Out of sight, out of mind. So Freddy's scoured the depths of Hell to get someone to strike fear into the heart of Elm Street, someone to make them remember him. There's only one person that fits the bill: Crystal Lake's resident machete-swinging hockey fan, Jason (Ken Kirzinger). Jason awakens from his post-Jason Goes to Hell grave and heads to Springwood, where he proceeds to go on a killing spree. Unfortunately, he goes too far, and Freddy decides that somebody's gotta stop Jason from taking all of his victims. Caught in the middle are Lori (Monica Keena), her boyfriend Will (Jason Ritter), and a group of their friends, who try desperately to stop both killers while their world comes crashing down around them. Luckily, they don't change Freddy or Jason's backstories, but add interesting twists to them. Past scripts were just unfortunately idiotic (such as one where Jason is a real guy that gets arrested and put on trial, and another where it's revealed that Freddy is really Jason's father), but Mark Swift and Damian Shannon hit the mark with their screenplay. They didn't dwell on the Dream Demons of Freddy's Dead or the body hopping of Jason Goes to Hell. As much as I love Jason Goes to Hell, I think not mentioning that was a good idea. It took Jason and Freddy back to their roots: Jason is an invincible killing machine, and Freddy is a sadistic monster. The characters of Freddy and Jason not only went back to their roots, but they evolved as well. In the past, Freddy was a loudmouth jerk, but in Freddy vs. Jason, he becomes true evil. He's an egotistical pervert, he's insulting, he's even a racist. And in this one, we see what has only been referenced to in the past: he murders a child. The murder itself isn't on-screen, but we know it happens. I said mentioned earlier that Jason returned to his roots as a killing machine. Well, that's not entirely true. He's more complex than that now. Part of Jason's mythology is that he drowned as a child, but in at least three prior Fridays, he jumps into Crystal Lake. He's not afraid of it when he's awake, but in his dreams, he's still a little boy. We see that in the past, Jason was a victim of bullying and humiliation from other campers, and he never forgot that. As an adult, he's not afraid, but in his subconscious, he's still scared. It's a nice little bit of development that the other ten Friday the 13th movies never really bothered to hit. Robert Englund once again hits the mark as Freddy. Sure, he's got the trademark one-liners, but he's an intimidating figure. If I didn't know any better, I'd swear Englund was a psycho in real life, because he's that convincing. As for Jason, Ken Kirzinger does a great job. Kirzinger's Jason was a lot more human, yet is still an unstoppable beast. I like Kane Hodder's Jason, but he only portrayed Jason's hatred for others, while Kirzinger managed to convey fear and despair. I liked the acting of the others in the movie as well. Monica Keena is great as the movie's requisite cutie-pie heroine. She's just so cute and innocent, and like all good heroines, she grows from a naïve girl to a tough young woman. Destiny's Child member Kelly Rowland (who plays Kia) way exceeded my expectations. Going in, I thought she was gonna end up being like LL Cool J or Busta Rhymes in the last two Halloween movies: a singer that's just there to be the token black person and/or comic relief. Yes, Kia had some comedic moments, but Rowland was a better actress than I thought she'd be. The rest of the cast put forth a decent effort as well, though Kyle Labine is only doing an impression of Jason Mewes and it seems like Jason Ritter spends the entire movie with goofy grin on his face (even during the dramatic scenes). I'm easy to please in the acting category, though. If they're not embarrassingly bad like the fifth or eighth Friday movies, I'm happy. There were also many references to the films of the past. Hypnocil, a big plot point in the third Nightmare movie, is a main factor in the plot here, as is the Elm Street House seen in all of the past Nightmares. The house looks great, as does Camp Crystal Lake. The camp is beautiful and frightening at the same time. There was a reference to the sack Jason wore in the second Friday, and a TV station called "KRGR," which was the radio station Johnny Depp listened to before his death in the first Nightmare. Yes, KRGR. Think about it. And the movie even included a lightning-speed cameo from Bob Shaye, the CEO and founder of New Line Cinema. The fight scenes are unbelievable, too. They met my expectations and surpassed them. I thought the one in the dream world was great, but when they enter the real world, holy cow! The sheer brutal awesomeness of it is mind-blowing. The two killers quite literally rip each other to shreds, but still get up for more. I should also point out Graeme Revell's wonderful score. If you ask me, I think it's light-years ahead of the music from Nightmares and Fridays from the past. While the only recurring themes from past sequels are Jason's trademark sound effect (you know the one) and a brief reprisal of Charles Bernstein's classic Nightmare theme, Revell's music creates a frightening atmosphere that gives the movie a much darker tone. Good stuff. The movie doesn't take itself lightly. It's not self-referential (though it does have some subtle references to the past) or a parody like prior films in each series, but a balls-to-the-wall horror movie. 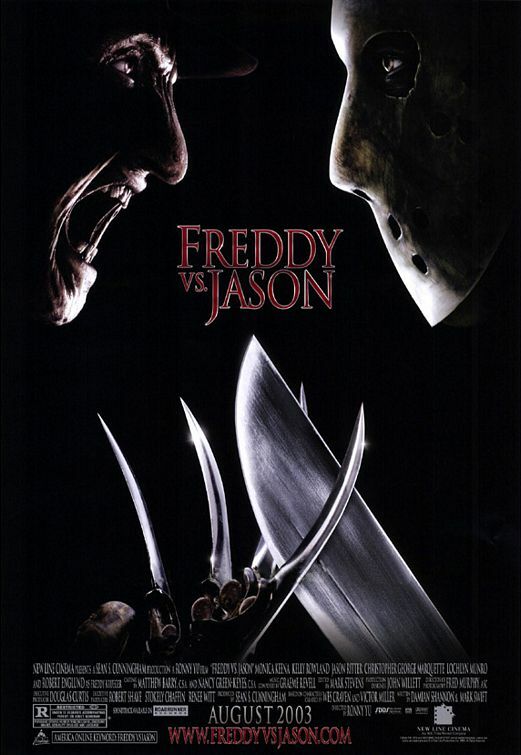 Personally, I think Freddy vs. Jason is almost perfect. Yes, it's a Nightmare on Elm Street and Friday the 13th sequel, and therefore will catch a lot of crap from non-fans, but it was worth the years spent waiting for it. The movie was a dream come true (I almost said "nightmare," but that would have been goofy), and I applaud director Ronny Yu, the cast and crew, and New Line Cinema for making this fan happy.